Resolving Business Disputes with ADR: What You Need to Know | TMC | Toki Mabogunje & Co. Arbitration and Mediation, 2 of the many methods available to users of Alternative Dispute Resolution (ADR), are fast becoming the preferred method of resolving business disputes around the world. Courts now reduce workload by referring commercial disputes to ADR centres for resolution, and huge successes are being recorded. The Lagos Multidoor Courthouse (LMDC) is one of such centres and it resolved over 500 cases in 2015. Arbitration & Mediation are gaining such traction, because they satisfy the basic needs of business people in conflict. Both processes are fair and efficient (in time and cost), and they guarantee that the rights of the people in conflict are protected. In Arbitration, parties in dispute agree on a neutral third person to make a binding decision that fully and finally settles their disputes. While in Mediation, the neutral third person helps disputing parties reach an agreed compromise. To help you understand these processes, below are a few things you should know, before engaging in ADR. This may go without saying, but in order to use arbitration / mediation, there must first be a dispute. If there is no dispute, there is nothing to arbitrate or mediate over. If an assertion or claim is unchallenged, then there is no dispute. An aggrieved party should simply seek enforcement of rights in court. Parties must agree to submit to arbitration/mediation, and it must be documented in a written agreement. This written agreement may be a clause in the contract, a separate clause specifically referenced for inclusion in the contract, or a separate document entirely – meant to handle disputes related to the contract. You will want to ensure that your arbitration/mediation agreement gives a wide range of authority to the tribunal, to decide all conceivable types of disputes and challenges. Note: Without prior written agreements, parties cannot be compelled to submit to the process. With a valid contract and arbitration or mediation agreement, an aggrieved party in the relationship can evoke proceedings, as applicable, to seek justice. The other party is then compelled by law to submit to the process. Similarly, all awards granted and compromises reached through these processes, are legally enforceable once formally documented. Unlike litigation, parties using ADR have full ownership of their disputes. 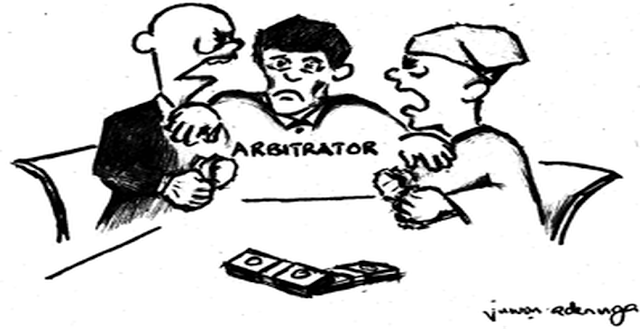 Arbitration users must agree on the nature and procedure of their arbitration, and also agree on any changes to be made at any point. Similarly, Mediation users must commit to working in good faith to reach a comfortable compromise. As they own the dispute, not the Mediator. Note: Parties are also at liberty to agree to ignore their arbitration and mediation agreements, and pursue litigation instead. Note: An arbitration is deemed to commence on the date the intiating party’s request to refer their disputes to arbitration is delivered to the other party. During Mediation, private communication between disputing parties and the mediator is allowed. As the mediator will need insight into the parties’ fundamental needs and concerns, in order to assist them. However during Arbitral Proceedings, parties in dispute must avoid any form of private communication with the arbitrator without first communicating intended information to the other party. As it is important that the arbitrator is not influenced or suspected of partiality, because his/her award will impose binding decisions that may have profound consequences on the parties. Once an arbitral award or mediated compromise has been formalised, successful parties should immediately find out and comply with requirements for enforcement by the courts wherever enforcement may be needed. If a losing party refuses to obey an award, only the courts can exercise coercive powers to ensure compliance. Note: In some jurisdictions, arbitral awards may need to be registered in court within specified time limits from publication. Successful parties should ensure that they do not run out of time where required. We hope that this information will help you better understand arbitration and mediation, and we urge you to take advantage them by inserting arbitration or mediation clauses into your contract documents before you sign-off on them. This is the only way to guarantee access to ADR services, as stated in point #3 above. For your convenience, 2 draft arbitration clauses are provided below. Any dispute or difference arising out of or in connection with this contract shall be determined by the appointment of a single Arbitrator to be agreed between the Parties, or failing agreement within fourteen days, after either Party has given to the other a written request to concur in the appointment of an Arbitrator, by an Arbitrator to be appointed by the Chairman or Vice Chairman of the Chartered Institute of Arbitrators Nigeria Branch. Any dispute arising out of or in connection with the interpretation of the provisions of this Agreement or the performance of same, shall be submitted to the Lagos Court of Arbitration and shall be resolved under the Rules of the Lagos Court of Arbitration. The dispute shall be resolved by a sole arbitrator, except as otherwise agreed by the parties to be by a tribunal of three arbitrators. The appointment of the Arbitrator(s) shall be in accordance with the said Rules, and the Award/Decision of the arbitrator(s) shall be final and binding on the parties. The seat of the arbitration shall be Lagos, Nigeria and the language to be used in the arbitral proceedings shall be English.